I grew up in a family of photographers: my grandfather, my father, my father’s elderly cousin. I still have grade school pictures taken with my first camera, a Kodak Baby Brownie. In 1964–65, my senior year at Mount Holyoke, I documented friends and school rituals with my mother’s 8mm home movie camera. Those reels, to be deposited in Mount Holyoke’s Archives & Special Collections, are a testament to the times, what has changed and what has not over the last fifty years. The instinct to record the world I lived in carried me through graduate school, museum work, photojournalism and, finally, through teaching photography and visual communication to a diverse group of international university students. My professional work put me in contact with fine arts photography--the “high art” collected by museums--and with the history of photography. At the Smithsonian’s Museum of History and Technology [now American History], I cleaned and polished the earliest camera lenses for display in the Centennial re-creation of the 1876 Philadelphia World’s Fair. At Sander Gallery in Washington, I organized a sale of nineteenth-century albumen prints, and I restored vintage prints by August Sander, Lisette Model, Aubrey Bodine, Manuel Alvarez Bravo, and others. Touching and caring for the work of these masters gave me a deep respect for the art and the science of photography, and for the stories they represent. I acquired my photographs as a teaching collection, and because I love old photographs. I used them in teaching the history of photography, and most recently to teach a lifelong learning course in Albuquerque, “Reading History through Old Photographs.” The collection includes “known” artists such as August Sander and Lisette Model, as well as unknown “vernacular” photographers. 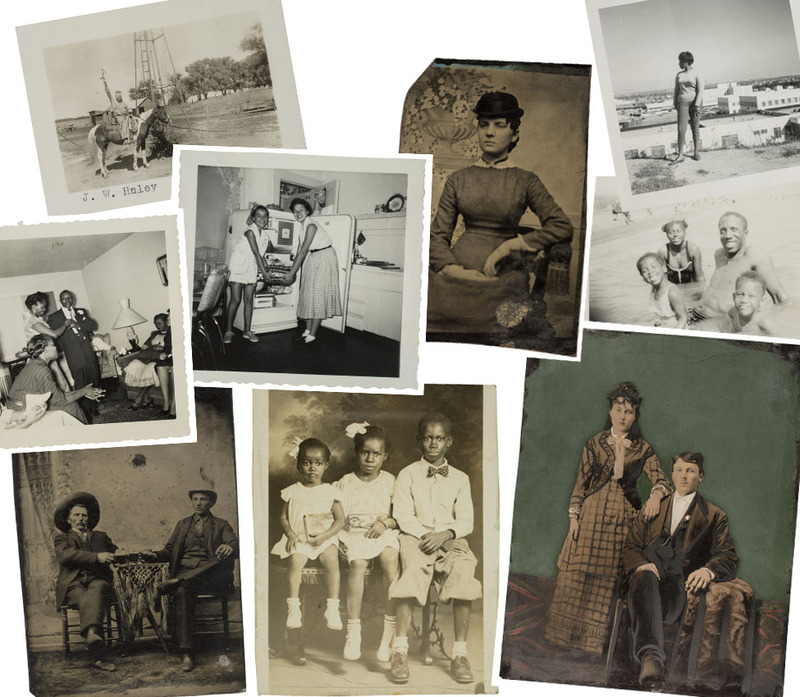 There are examples of photographic styles and processes: Daguerreotypes, tintypes, cyanotypes, albumen large format prints, cabinet cards, cartes-de-visite, early Kodak Brownie prints, postcards, and twentieth-century snapshots. There are documents of social history which can support research in many areas including fashion, gender, industry, transportation, optics and chemistry. In teaching everything from visual literacy and basic photography to the history of animation, I became a crusader for identifying family photographs. I tried to educate students to spend time with their elders, to label family photos and documents before their history is lost. Most of my collection came from yard sales, thrift shops, and antique malls, where the pictures had landed after losing their families. That loss made me sad, and I felt a responsibility to save what I could of those images. Even as anonymous documents, they record people, places, times which inform our present and expand our history. I felt this was particularly important in the case of images from minority groups who might have lived a mobile life, unable to preserve many family possessions. I have little record of the African American branch of my own family, and I feel that loss, both for the void in my own history and for the rupture in the lifelines of those people now forgotten. I donated my photography collection to the Mount Holyoke College Art Museum because of its tradition of active use of the collections by faculty, students, and classes in many disciplines in addition to art and history. I trust this collection will nurture the appreciation of classic photography and encourage research into the history it represents.